Casio GA110SN-7A.Injected sneaker Style street canvas shoes style new color! Injected sneaker Style street canvas shoes style new color! 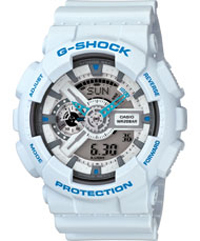 Selection of today’s most popular blue tones combined with GA-110 watch, interest strong street, there are blue lake and snow and ice blue are two options to add an Qinliang charm of being in the summer. With impact-resistant construction, waterproof 200 meters, 1/1000 second chronograph, countdown timer, world time, and many other features.